Penicillin only became widely available for the treatment of syphilis from 1946, producing a quick and total cure. Between ca.1910 and 1946 standard treatment involved multiple injections of arsphenamine (an arsenical drug) over 12 to 18 months. Older, cheaper but even more toxic treatments using mercury were often used in black patients and incomplete treatment was practically the norm, so disease progression was not avoided. Peri-urban and rural black patients had to rely on mission clinics and hospitals, or seek treatment from district surgeons. Many consulted herbalists and it is probable the majority received no treatment at all. From the late 1930s, in response to labour shortages, local urban authorities finally began to introduce a clinic system for black patients, along with education campaigns and contact tracing. Mercury for the treatment of syphilis was applied topically in the form of ammoniated or salicylated mercury ointments. 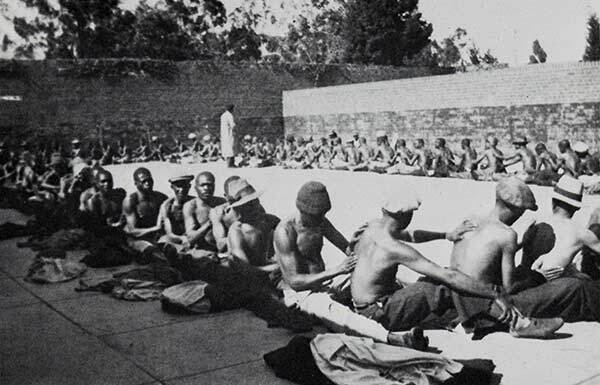 The photograph of patients applying "blue ointment" to each other was taken at Rietfontein Hospital, Johannesburg, circa 1911. Arsphenamine encephalopathy was a rare but important complication of treatment with salvarsan (arsphenamine). This specimen was from a 27y old woman who was in the 3rd trimester of pregnancy when treatment for syphilis was started. She developed a severe headache, confusion and focal neurological signs. She gave birth to a living child before she died. 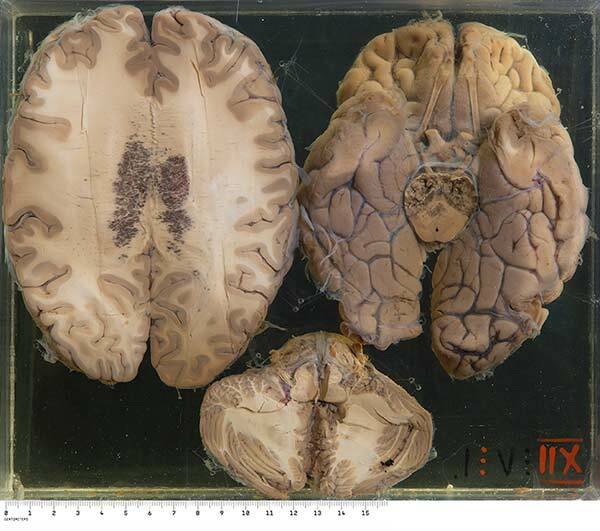 The characteristic lesions in the white matter of her brain are strikingly symmetrical and consist of groups of petechial haemorrhages often accompanied by frank necrosis. In 1940 the South African Red Cross Society released a health education movie aimed at African men. 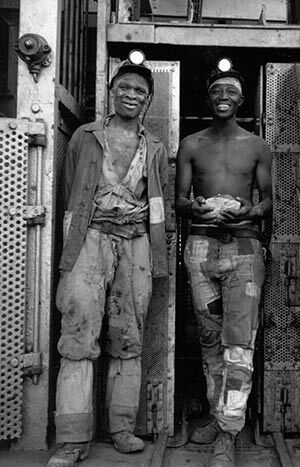 The Two Brothers was about Sifo and Nyati, who went to town to work on the mines to earn their lobolo. Nyati befriended a domestic worker, while Sifo visited a prostitute. The brothers discovered they had both acquired syphilis. Sifo visited an inyanga, while Nyati received free treatment at a clinic. The film showed the taking of blood for a Wasserman test, the weekly injection treatment and the gross lesions that appeared in the untreated. The bothers returned home and Sifo decided to marry, despite Nyati’s warnings. Nyati continued treatment until he was cured. Ten years later Nyati was happily married, had three healthy children and many cattle. Sifo’s wife was dead, his only child was blind and he had sold his cattle to pay the inyanga. Finally, Sifo agreed to visit a clinic to have proper treatment.